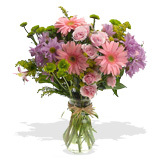 It has never been so easy ordering floral arrangements thanks to FlowerFresh is easy to navigate online flower shop. Choose mixed floral arrangements from many different styles. Rose floral arrangements can be created in a rainbow or colors, or just one. We offer roses for every occasion in many different designs and all our roses in our rose floral arrangements are handpicked at the largest rose farm in Colombia. ROSE FLORAL ARRANGEMENT CARE INSTRUCTIONS: Our rose floral arrangements come prearranged in floral foam, also known as an oasis. Rose floral arrangements need to be watered daily to ensure that the floral foam stays moist at all times, as roses find it harder to take in water when inserted in a foam as opposed to when arranged in a vase filled with water. We advise that you mix the rose floral food in a container with luke warm water and feed your rose floral arrangement with the floral food solution daily. Your rose floral arrangement may have had a difficult and long journey to get to you, feel free to remove the outer guard petals on the roses left on to protect your rose floral arrangement during shipment. Also remove the wooden floral sticks inserted in the four corners of the container, inserted to support your floral arrangement during travel. In the event that a single rose flower has come displaced from the floral foam, just reinsert the rose flower back in the floral arrangement, from where the flower was displaced. SEND RED ROSE FLOWERS: Send Red Rose Flowers to make a romantic impact on someone special. There's nothing secret about the red rose's symbolism of love, Valentine's Day would hardly exist with this bold and dramatic bloom. The Ultimate symbol of romantic love and enduring passion, the red rose also convey respect, and the creative spirit of love, Representing true love stronger thanks thorns, the red rose is know universally as the lover's rose. A single rose in Bloom signifying "I still love you." Two roses together, "convey a commitment, a dozen roses is "the ultimate declaration of love," fifty roses conveys unconditional love." Send a rose floral arrangement to capture the heart of someone special.